Carl Finds Himself Surrounded by More Charred Bodies Than Usual | Words. On the Internet. 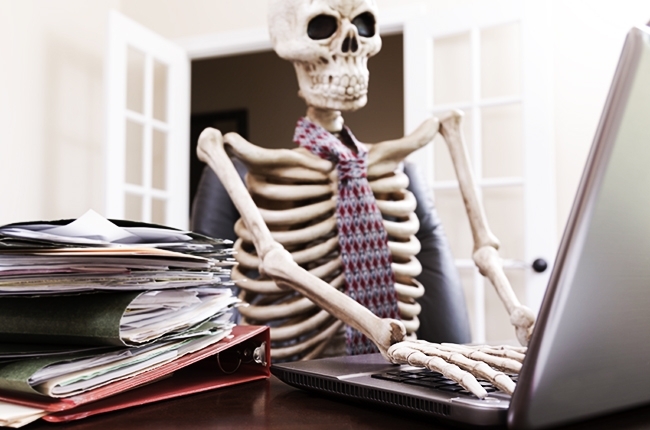 Nothing says “approachable businessman” like a skeleton in a tie. Carl stared down at the dusty clipboard in his boney hands, quickly running his pale, ivory finger down the page. There were a lot more names than usual, at least a few million today. Was it Christmas again or something? Did Christmas happen twice per year now? It had been a while since he’d been alive, he couldn’t exactly remember if that was something the living were working on instituting. He glanced down at his watch, the hour and minute hands stuck in the same position they’d been in for the past forty-or-so years. He’d been meaning to get it fixed, but hadn’t had the chance. His job didn’t exactly allow for much free time. Regardless, though, the date counter still worked for some reason. April 17th, a weird day for second-Christmas. Perhaps it was just a Tuesday, there were always more deaths on a Tuesday. “Please help,” pleaded a strained voice from in front of Carl. He glanced down through the glass teller-window in front of him and searched for the source of the sound. It had come from a man on the floor, his skin charred black and almost dissolved, his face nowhere to be found. Probably a burn victim or something. There seemed to be a lot of burn victims today, in fact, with a nearly endless sea of charred people forming a somewhat orderly line behind the man. “Hello,” Carl said, doing his best to seem like he was smiling. It was always difficult to appear friendly, considering his complete lack of skin. For some reason, being a skeleton had received a terrible reputation amongst the living, which made Carl’s job all the more challenging. He didn’t think he was mean, or rude, or anything of the sorts. Sure, he was ultimately responsible for the deaths of trillions, but that was mostly their own fault. Suicide, heart failure, cancer, general malaise—he wasn’t the one murdering them. He was simply finalizing the act. “What’s going on?” whimpered the man, his voice cracking as he spoke. “It seems you’ve died,” Carl said, continuing his attempt at smiling. If he had skin, he was sure it would be contorted in the most friendly face possible. He hoped that thought was getting across to the partially vaporized man crumpled in front of him. “I’m sorry?” the man said, his body quivering as if he were trying to stand, but had forgotten that he no longer had any legs. “What do you mean ‘dead?’” the man said, his voice cracking slightly as he spoke. “You know, kicked the bucket. Deceased. Bought the farm. Checked out. Passed away. Pushing daisies. Dead.” Carl could’ve gone on for hours, but figured that was a good point in which to stop. “Did you, perhaps, explode on the way to your office?” Carl asked, picking the clipboard back up off the wooden counter in front of him. “No, I don’t think so,” the man said. Carl glanced down at the clipboard and carefully ran his pointer-bone across the page, waiting for the man’s entry to appear. There were so many names already, so many more people than usual. He hadn’t seen such a high death toll since, well, the last World War—which was, quite honestly, his favorite of the two. The man’s information finally began to appear in the slot beside Carl’s finger. His name had been Henry Smith, born and raised in Austin, Texas. According to the paperwork, he’d once tripped in front of his soul mate and broken his leg. He pretended that it had been on purpose and walked home with a near compound-fracture, the two of them never speaking again. “Never mind,” Carl said. He turned his attention back toward the paper. “Let’s see,” he said, “cause of death.” He ran his finger across the page, the details of the man’s life filling in between the lines as he scanned. “Oh,” he said, pausing. That explained it. “What?” the man said, shifting uncomfortably. In fact, everything he did looked incredibly uncomfortable. Carl glanced up from the clipboard and stared out at the empty expanse of purgatory behind him, the rows of badly charred bodies moaning and wailing softly as they waited. It had been a long time since he’d seen the nuclear war crowd. They were always the hardest to process, specifically due to their numbers. He’d probably have to kill through lunch, which was unfortunate as he’d gone out of his way to make a ham and cheese sandwich earlier in the day. Still, it probably wouldn’t go bad in the time it took to process the few million in today’s incoming class. He could always have it for dinner.